We’d like to start off our 2nd edition of GardenTalk by welcoming May, the kick off to our favorite season. We consider this time of year an opportunity for expansion on your home oasis. You can now consider your backyard an additional “fun room” to relax and enjoy with friends and family. What’s New? Our website! We’ve freshened up our website and hope you enjoy the new features and functionality. An electronic version of our newsletters will also be included on our new site. Special Spring Tip: We encourage you not to overwater your yards, for specific watering recommendations for the spring season, please contact our office. As always, we’d like to thank our customers for their continued business. We are looking forward to continuing our partnership with you as we head into the Summer! Special Announcements…Welcome, Steve Vandenburgh and Mike Mescia! Elite Property would like to welcome Steve and Mike to the team! 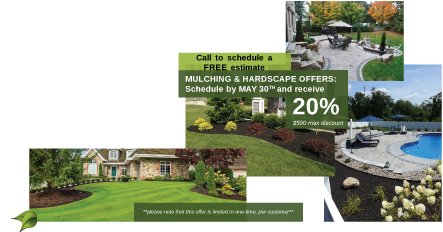 Steve and Mike recently joined Elite as Foreman of Lawn and Landscape related-services. Combined they bring nearly thirty years of industry experience and we are excited to have them as a part of the team. Steve and Mike look forward to having the opportunity to work with you as we head into the spring and summer seasons! Want the ultimate eye-popping curb appeal? It’s all about a healthy balance between architect and vegetation. Here are our tips on creating a successful hardscape design. It’s important to know what you are working with. Deciphering dying trees and weeds with healthy trees and vegetation will help to set the stage. You should also consider your landscape as a whole as opposed to sections for a seamless flow. Living in Upstate NY, your environment will inevitably have rain. If you’re adding a retaining wall or patio, you’re going to need to know how your new design will affect your draining system. Planning a run-off where you can capture the water to reuse for your vegetation is far better than having it hit the concrete with no place to go, or worse, having it lead inward, towards your home, causing an array of water damage issues. Like in a painting, you want the eye to travel around the entire landscape, towards a destination. This could be a Weeping Willow, an elegant fire pit or a rustic light post. Having a focal point will help to develop your hardscaping in an organized, elegant manner. The biggest “no-no” in hardscaping, is not taking the appropriate care in preparing the site before building your hardscaping. Ensure your efforts will last by starting on a ground that is level and compacted. You will also need to remove roots to prevent trees growing into your hardscaping. It’s common for beginners to collect small boulders and place them around a flower bed. You need to consider the size and depth of the boulder. You want them to be large enough and buried deep enough to look like natural occurring elements. Also, consider creating curves and rounded shapes to your walkways and patios. Straight, L-shaped sidewalks and pathways can appear too linear and unnatural, disrupting the elegance and flow of your landscape. Anyone embarking on a hardscaping project that involves building a retaining wall, stairs or patio should consider consulting with an expert to prevent injury or serious damage to your property. Elite Property Care brings over a decade of experience in landscape design and installation, stone patio and paver patio installation, pool decks, outdoor fire pits, and fireplaces, retaining walls and lawn & garden care to homeowners.